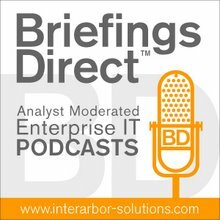 Dana Gardner's BriefingsDirect: What ever happened to the withering RIA market? What ever happened to the withering RIA market? This guest post comes courtesy of ZapThink's senior analyst Ron Schmelzer. Traditional market research focuses on the size and growth of well-defined market segments. As vendors enter and compete in those markets, customers participate by purchasing products and services within those segments, and market research seeks to establish the patterns of such transactions in order to predict the future trends for such markets. In the information technology (IT) space, however, many markets are transitory in that as new technologies and behavior patterns emerge, what might formerly have been separate markets vying for customer dollars merge into a single market in order to address evolving customer needs. Over time these separately identifiable markets lose their distinct identity, as products and customer demand both mature. The Rich Internet Application (RIA) market is certainly no exception to this pattern of market behavior. As we originally covered in a ZapFlash back in 2004, a RIA combines elements of rich user interactivity and client-side logic once solely the domain of desktop and client/server applications with the distributed computing power of the Internet. In essence, a RIA is a hybrid client-server/web application model that attempts to bridge the gap between those two computing approaches and address the limitations of each. However, in the subsequent half-decade since that first report came out, it is becoming clear that the concept of RIA spans the gamut of applications from those that barely have any richness to them at all in one extreme, to considerably rich and interactive applications that made use of a wide range of RIA capabilities in the other. From this perspective, it’s evident that an application can have all of the characteristics of an RIA application, none of the characteristics, or somewhere in between resulting in a spectrum of richly enabled applications. At some point, won’t all Internet applications be rich, and all desktop applications become Internet-enabled? From a services oriented architecture (SOA) perspective, RIAs are simply the user interface to composite services. This is why we care about the RIA market: To the extent that organizations can abstract the presentation of their services from the composition of those services, and in turn from the implementation of the services, we can introduce greater flexibility into the sort of applications we deliver to the business without sacrificing functionality. However, more importantly, as an increasing range of applications add richness to their capabilities, what it means to be an RIA is increasingly becoming blurry. At some point, won’t all Internet applications be rich, and all desktop applications become Internet-enabled? If so, then does it even matter if a separately discernable RIA market exists? Macromedia, now part of Adobe Systems, introduced the RIA term in the 1990s to delineate products that addressed the limitations at the time in the richness of application interfaces, media and content available on the Internet. Today, RIAs comprise mostly Web-based applications that have some of the characteristics of desktop applications, where the RIA environment typically delivers application capabilities via Web browser plug-ins, native browser capabilities, or vendor-specific virtual machines. In the past few years, new RIA solutions have also emerged to provide desktop capabilities that leverage the same technologies available in Web applications. Richness of Internet Capabilities – The extent to which the application or technology leverages the full functionality of the Internet. Richness of User Interface – The extent to which the application or technology delivers interactive, deep, and broad user interface (UI) capabilities. Richness of Client Capabilities – The extent to which the application offers client computing capabilities that utilize the local machine power, such as storing information locally, using local memory and disk storage, and shifting processing power to the desktop from the server. As can be gleaned from the above picture, there’s no sharp delineation between what can clearly be identified as an RIA and what cannot. As new technologies and patterns emerge that increase the capability of the web application, browser, and desktop, that delineation will continue to blur. When Adobe acquired Macromedia in 2005, it also acquired a legacy that included Shockwave, Flash, and Flex. This legacy of RIA experience has culminated in the recent release of the Adobe Integrated Runtime (AIR), an RIA environment that facilitates the construction browser-independent Web applications that have many of the features of desktop applications, including offline capabilities -- in other words, RIAs. The ubiquity of Adobe’s Flash plug-in has helped to make the vendor a dominant player in the industry, even though it does not have its own browsers, operating systems, or general-purpose application development environments. However, while Adobe is currently the biggest and most experienced RIA vendor selling commercial RIA licenses, it faces serious challenges on multiple fronts, most notably from Microsoft. Microsoft’s dominance in desktop and Internet application development, as well as its commanding market share of Web browsers and desktop operating systems means that it should be taken seriously as a threat to Adobe’s commanding share of the market with the introduction of the company’s Silverlight offering. Also at the end of 2008, Sun released JavaFX, its long-awaited entrant in the RIA race. The question still remains, however, how the battle for the RIA space will be fought before the time it’s absorbed into other markets. As the line between browser-based and desktop-based applications blurs, and as approaches for abstracting functionality and information from user interfaces develop, other markets will eventually merge with the currently separately identifiable RIA market. Furthermore, as the Internet continues to penetrate every aspect of our lives, both business and personal, the distinction between “Internet application” and “application” will disappear, rich or not. Earlier this year, ZapThink surveyed a number of enterprise end-users to obtain more information about the context for RIAs in their environments. The single consistent theme across these interviews is the enterprise context for RIAs. Because these practitioners are architects, their scope of interest covers the entire enterprise application environment, rather than usage of RIA for one specific application. Within this context, RIAs are the user interface component of broader enterprise applications. For those architects who are implementing SOA, the RIA story focuses on the service consumer, which is the software that consumes services in the SOA context. Such consumers don’t necessarily have user interfaces, but when they do, RIAs typically meet the needs of the business more than traditional browser interfaces or desktop applications. As a result, there is increasing demand for RIA capabilities in the enterprise, although people don’t identify the applications that leverage such capabilities as RIAs. Rather, RIA capabilities are features of those applications. This further serves to make indistinct a separately identifiable RIA market. However, this dissolution of the RIA market as a separate market is still several years away, as all indications are that the RIA environments market in particular will continue to experience healthy growth for years to come.